This post was inspired by casual clients who are loving chinos for Spring and Summer because they’re casual, covered, comfortable, easy to launder, and a break from wearing jeans. Note that chinos needn’t be a shade of khaki. If khaki’s not your thing, think pearl grey, charcoal grey, olive, peach, cranberry, aqua, light blue, lemon, lilac, navy, pink, mint, coral, mustard or white. Olive, cranberry, coral and pearl grey have been winning chino colours for clients this year. I’ve shown three versions of the easy chinos outfit. An earthy rendition on the left, a modern classic vibe in the middle, and a colourful look on the right. Let the creative juices flow. Here are the components of the outfit. Chinos: Choose a pair of cotton-rich chinos in a colour that tickles your fancy. Boyfriend silhouettes that are rolled at the hem are fab, but so are trendy cropped wide leg styles. Top: Choose a casual T-shirt, blouse, pullover or knitted top in a pattern or solid. I’ve chosen a floral blouse, a striped tee, and a knit top with lace insets because they’re current favourite chino pairings for clients. Denim Jacket: Choose a light or dark denim jacket in a fitted or oversized silhouette. A white denim jacket works too. A light and white denim jacket looks particularly good with pastel and mid-tone chinos. Prettier and softer. Hard-edged gals will prefer a dark blue denim jacket. Footwear: Choose casual footwear that works with the palette like espadrilles, wedges, wrapped sandals, mules, gladiators, thong sandals, or sneakers. A pair of classic penny loafers looks good too. Personally, I like the look best with footwear up to an inch in heel height. Accessories: Finish off the outfit with a casual bag like a tote, backpack, crossbody or hobo. Add a scarf to jazz things up. Add jewellery, eyewear, headgear and watch as desired. This is a very fun ensemble, Angie. I like all the renditions, though I probably wouldn’t wear khaki colored chinos. I have three-ish pairs of chinos: two BF pairs in white and olive and a pair of lilac utility Sloan pants that is somewhere between a chino and a classic Sloan pant. 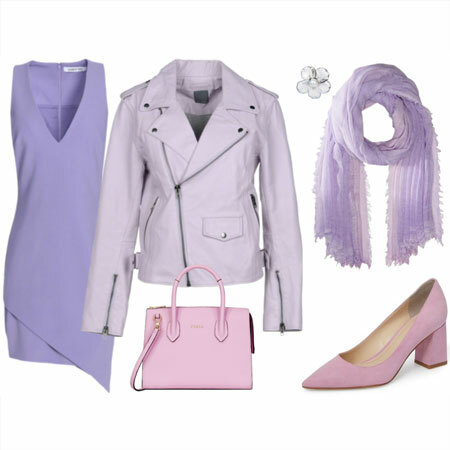 I think I will try to put an outfit together based on the lilac pair. I have been also toying with the idea of trying to shrink the two BF pairs in the dryer, as they are both quite oversized (bought a size bigger on purpose during the peak of the BF pant trend), and these days I much prefer sleeker fits. How beatuful, I love, love all.Chinos are great for summer to my mind . I will try some of these. Fun ensemble. But I will be sporting my own version with white denim or linen blend trousers in grey. I don’t know what it is, but chinos always feel too “boyish” to me and I am never comfortable in them, even in colours other than khaki. I’ve tried multiple times, wear them once or twice, feeling awful — and then donate. Yet I love them on others! I do, however, like chino *shorts* on myself for some weird reason, so that might be my alternative option. Such a fun, relaxed look. I can’t wait for my pink chinos to arrive (fingers crossed they fit) so that I can try this ensemble! Inge’s pink chinos sound fantastic! Colored chinos are very early 80s and naturally I have always gravitated to them. I two pairs of chinos – one in white and a second in a washed-out turquoise. The turquoise are my favorites – I wear them with a swingy white eyelet blouse and metallic sandals. Blush chinos were added to my closet earlier this year, and later a pair in khaki (or tan) joined them. I love that they are 98% cotton and lighter weight than jeans for the hotter summer days. The blush are already in heavy rotation. You’ve given me some ideas for my weekend outfit. Very funny, relaxed, Springy looks! I like them. By the way I have always wondered what “chinos” are and where the name comes from. It seems they are casual cotton pants, right? This is right up my alley for spring/summer. In fact, I wore this ensemble this week! I just bought a pair of J Crew Factory chinos in a green that’s a bit greyish (hard to describe – they call it quarry green). I love them because they’re 100% cotton and lightweight. I also bought an adorable white tee with a sailboat motif (I grew up sailing on Lake Ontario and miss it!). 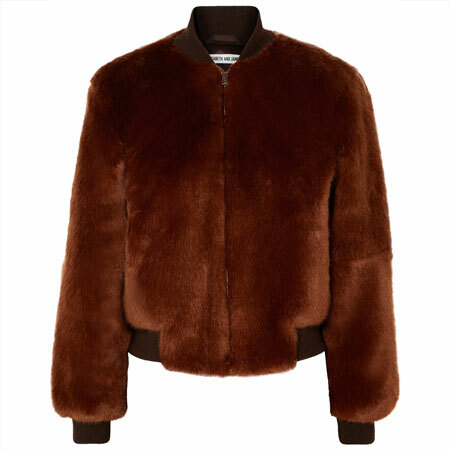 I’ve paired it with a denim shirt and another time with a blue denim jacket – sandals or slip on sneakers. This summer I’ll add a straw fedora and navy wristlet. Perfect! I think I’m finally coming to terms with the fact that I’m a preppy at heart (at least in the spring and summer). What great ensembles! Funny enough I have trouble finding chinos to fit, I seem to run into issues with the length of the rise and the length of the pants. 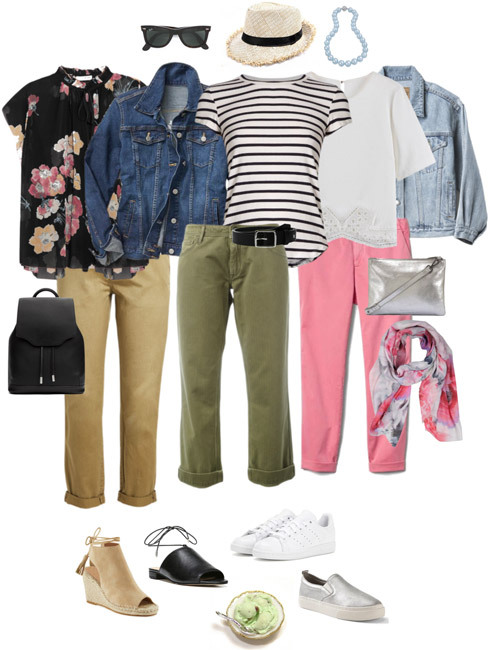 Fun, casual warm weather looks! I don’t own chinos and haven’t for awhile. They are a great weight for spring, but their angled pockets at the hip often drive me crazy and they aren’t me somehow. Like Suz, I’ll sub white jeans and my linen pants/crops for the chinos and be good to go. Look forward to seeing them on others. I’ve been enjoying my new charcoal and light olive chinos, as well as the blue ones I got last year. All are from Anthro — they usually have a nice selection of colors each spring. I do enjoy them in spring and summer because they tend to fit looser than jeans and provide a nice variation from wearing denim most of the time. So this is an easy go-to ensemble for me. 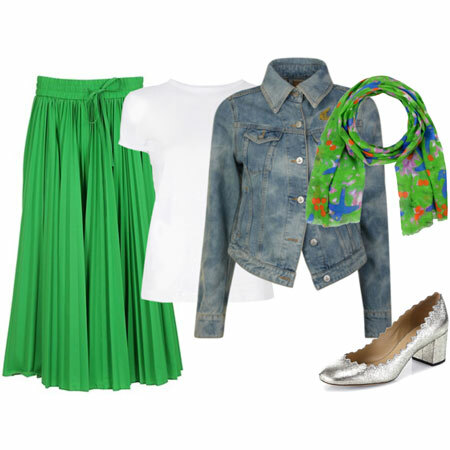 Another fun way to create a casual outfit with many variations. I bought a Gap pair of wide leg chinos in a dark khaki color but they need to be shortened. This will get me going. I always hesitate on committing to a length. I’ve been scouting a bit for chinos this season, with no luck so far. These outfits will be a great resource for me, should I snag just the right pair! I have a pair of Banana Republic khaki chinos that I got at the end of last season–they’re a great combination of flattering and comfortable. Will try the combos here. I have the jean jacket too. Oh and I have olive Sanctuary cropped pants that work for this. In the future, I’m interested in finding pink or red. 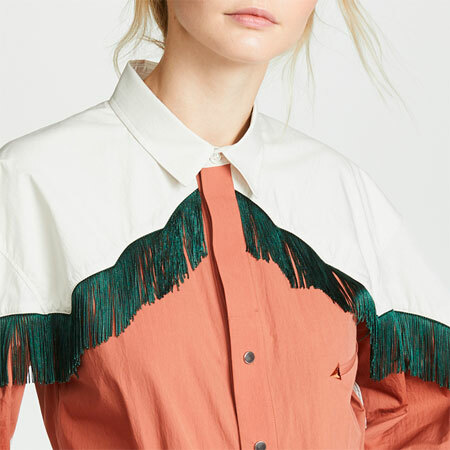 At last there is an ensemble I can shop my closet for! I got BR boyfriend chino crops last year and they have been very useful. I like that they are more lightweight than denim for summer. They also roomy on my calves which is a rare thing. It was also interesting to add olive colored bottoms and find that they work pretty well with my current wardrobe which is not warm toned. Actually thinking about this I was wearing multiple variations of this ensemble on my recent trip to Italy in May so I have been ahead of the game! These pants travel really well! Angie, are you still wearing your chinos – I think you got a pair a couple of years ago? Suz, I hear you! I also did not feel chinos before but those BR ones feel different: relaxed and structured in the same time somehow…fabric also feels of better quality than regular chinos. If BR has chinos this year you may give them a try. Chinos are almost a weekend uniform for me but looking at your post, I’m realizing my tops are fairly uninspired. Now I’m thinking about how to remedy that. The top choices are inspiring. I’m going to have to try something other than a plain tee or button down! Thanks! I don’t like chinos on myself but I could see myself substituting linen or lightweight denim. I bought a pair of grey ones recently. We’re going to our community theater tonight so I could actually put this outfit together! This is pretty much my weekend look on a cooler day. I prefer the pants in an army green colour and usually have a few pair in my closet for about 3 seasons a year. As Alecia mentioned above regarding her own wardrobe , my tops are rather uninspired also and could use an upgrade, but I do find casual tops a difficult thing to find . I am trying to stick to my plan of not buying anything until I sort out my wardrobe and pare it way back (I’m more than halfway done now) but it is affecting my dressing . I’ll get there yet! Love this! I don’t have any chinos at the moment but I do have a pair of coral skinny jeans I could substitute. Will have to go searching for some olive chinos! I think Suz hit on my problem with chinos – I seem to keep buying a pair only to chop them off into shorts because they feel too “boyish” or something. I’m down to like one pair that I haven’t chopped and don’t reach for them much at all. I do like the olive and blue lounge pants I bought from Loft and those are my replacement “chinos” I guess – but they are more of a fall/winter/early spring item here. I recently added a pair of lightweight taupe jeans and white twill jeans and those feel so much more right so I guess it’s partly in the fabric and partly in the style of the pants. Reading some other comments and looking at the examples again makes me think that choice of tops is important for certain pants to work and maybe that is a big part of the problem for me with chinos. I probably need to try to style the one pair I have left with more feminine and interesting tops to feel “right” to me. Great inspiration today, Angie! I have a pair of peach chinos I bought at the end of the season last year that are just staring at me so maybe this is the push I need to just put them on! I bought a pair of gray at Loft this year and haven’t worn those either…not sure why because this is just a fun and easy casual outfit! I have several pairs of chinos that I like to roll and wear in the summer for casual work outfits. They’re cooler than jeans which can just be too heavy and hot. I like them in colors other than khaki – I have them in mustard, blush, blue, and maroon. I have a pair of khaki chinos that have not worn at all this year. I also have a pair in bright orchid that I tend to wear more. I might try this with both of them and see which one works better. Plenty to love here, Angie. I need to add some chinos to my wardrobe – just as long as they’re not khaki! Lots of love for this casual look. It’s a goodie. Non-khaki chinos, FTW. Tanya, I’m excited to see what you put together with your lilac chinos. And thumbs up on shrinking the oversized BF chinos. Suz and Eliza, I’m not a chino gal either. For me, they are simply too casual for my style. I’m sticking to white jeans and printed pants as my casual jeans alternatives. But I like chinos on others. It’s fab ultra casual vibe. Inge, wooohooo. I’m excited. You’re going to look super cute in chinos and stripes. Rachy, you need PINK chinos. Laura, sounds perfect. When are you going to post your outfits on YLF again? Merwoman, is the rise too low or high? Janet, you wear chinos with the best of them. Great Summer ultra casual pants. Joy, can’t wait to see them. Beth Ann and gardenchick, did you try the Loft chinos? Sveta, I miss you. You have much to update us on. (No, I passed on the BF chinos a few years ago. 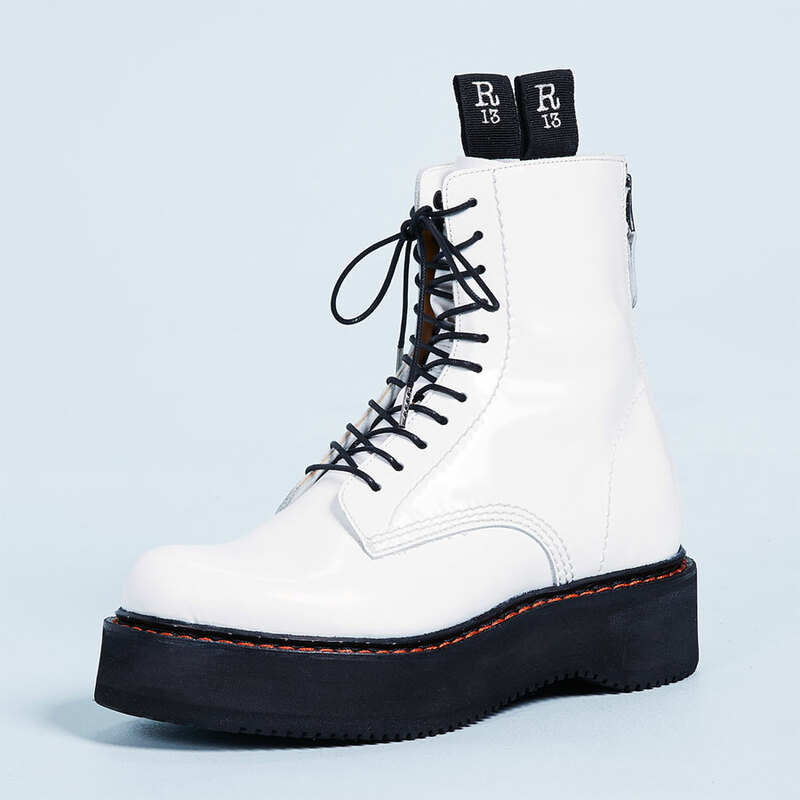 Too boyish for my current sartorial preferences). Lisap, VERY happy to hear that you’re NOT buying anything till you’ve done a proper closet edit. Mary, you need olive chinos. Texstyle, you hit the nail on the head in your second comment. Carole, peach chinos sound heavenly. And I can’t imagine that a bomber jacket is hard to fit on you. Merwoman, have you tried the chinos from Anthro? Just in time! I have refreshed my chino capsule, discarding some unflattering fits and adding two new pairs: olive and navy, in a slight boyfriend style with rolled cuff. I will be referring to this ensemble for styling ideas. I love chinos! I have dark gray, light gray, dark gray green, “weathered” green, navy, light khaki, dark khaki, white, I’m thinking I don’t really need any more! No – just BR and Gap. Thank you for the suggestion for Anthro. PSA, the GAP chinos are on sale today with promo code FLASH: 40% off for the next hour and then 35% until midnight! Just ordered in several colors including pink and olive! Ooh. Pink. Dang, that’s brilliant! I love this look. I used to buy chinos from the Gap (in the 90s) but for some reason the fit is off now. Rise too low. Now that I see your comment to merwoman I am going to try Anthro chinos. I love the softness of chinos, and will definitely be on the lookout for another pair (I do have a pair of lavender ones) but will be careful to check side pocket placement–on my hips they tend to gape open if not just right. I think it’s a problem for many women with hips. After all, chinos started out as men’s pants. I absolutely love having chino pants ,but alas I am up a size from menopause so patiently attending my WW meetings to get back into mine. This outfit formula is right up my alley when the mood strikes and I am Pinning it for later reference. Thank you for the inspiration! I am loving today’s post! I can shop these looks from my closet. Chinos work well for me because if we get really hot summer days, they are much cooler than jeans. On the other hand, if we get chilly summer days, which happens living on the coast, chinos keep my legs warm enough. I have traditional khaki chinos and olive green ones. I have a coral cropped pair and 2 BF pairs in pink and gray, I love to pair the BF chinos with a pair of cage sandals, or sassy heels and a dressier top. My traditional chinos I tend to wear with other casual attire: short sleeved Ts, striped tops and jean jackets. The fit is important. If the rise is too low, or the leg a tad to wide in the wrong places, they don’t work for me. I have had the best luck with Talbots petite. J Crew works well for me, too. I have a navy pair and olive pair but never sure of how much or how little to roll up – suggestions appreciated. They always seem too short or long –what’s the magic number from ankle bone? This has been a very useful post for me. I have chinos and never wear them and now I know why. They are too casual for me. I can now happily donate them and realise that they are just not for me. I will wear this ensemble with white jeans. Where I have struggled is that I see this look on others and love it, yet it feels off when I wear it. Love this post. I actually have a pair that I couldn’t figure out to wear. Now I know! And Laura: I’m loving the sound of your turquoise chinos too! Fun to hear how the ensemble has inspired you. I like the middle version. I find cotton trousers more comfy than cropped jeans this season. Difficult to find, though, most items sold are cheap sheer cotton, conservative/masculine straight khakis. I’m still in love with breton tops. Skylurker, good to hear from you. It’s been many months. It’s just like you to prefer the middle option. Suits you to a tee. Love this ensemble. This capsule gives me great ideas for the last week of school outfits. I just returned the silver sneakers to the Gap. They look great in the photo, but not so attractive on a size 11 foot. I was hoping that they would be a keeper. This post inspired me to check a weekend sale for a pair of chinos. Upon discovering the offerings were khakki, dark blue and baby blue, I checked back on the comments for help deciding. Darker blue ones for the conditional win (it’s an online purchase). Thank you for speaking up against the khakki chino, Angie – you helped cement my decisio! I could see this being a good base for parental visiting, particularly with my assortment of colourful tops. I adore this look, because I picked up a pair of chinos towards the end of last year and they quickly became a new favorite. The lighter material vs jeans is very appealing when it’s hot outside.